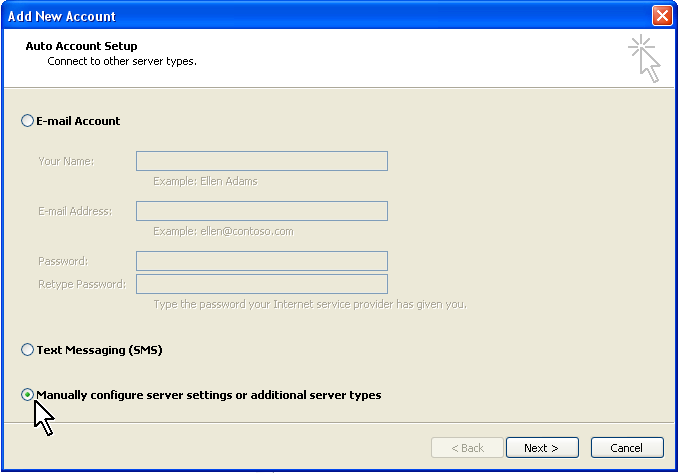 Select "Manually configure server settings or additional server types" and click [next]. Select "Internet E-mail" and click [next]. 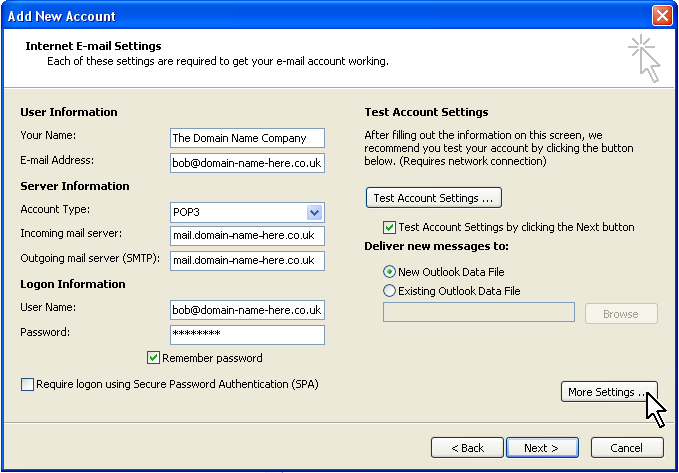 Fill in your company name (or personal name) along with the email address you wish to use, then select POP3 as the account type. 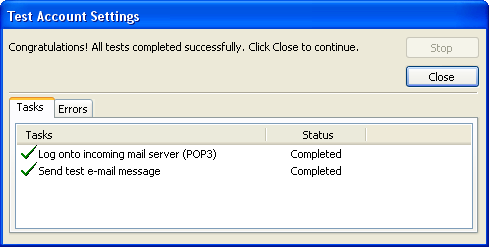 Both the Incoming mail server and Outgoing mail server need to be set to the server name from the instructions we've sent you. Enter the password you created for the mail account you've set up and tick the "Remember Password" tickbox. 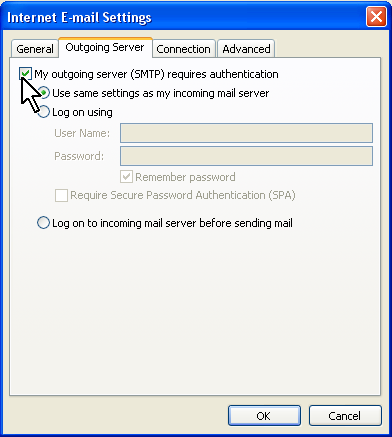 Click the "Outgoing Server" tab and tick the box for "My outgoing server (SMTP) requires authentication" and select "use same settings as my incoming mail server". 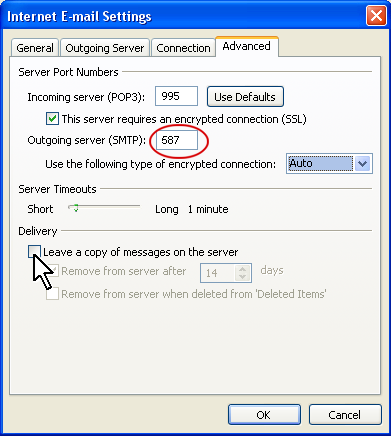 Click the "Advanced" tab, click the box for "This server requires an encrypted connection (SSL)" and change the Outgoing server (SMTP) port number from 25 to 225. Select "Auto" or "TLS" for the encrypted connection type. The default settings for this program will leave mail on the server indefinitely and this WILL cause you problems in the future. Therefore we recommend that you remove the tick from "Leave a copy of messages on the server". Click [OK]. 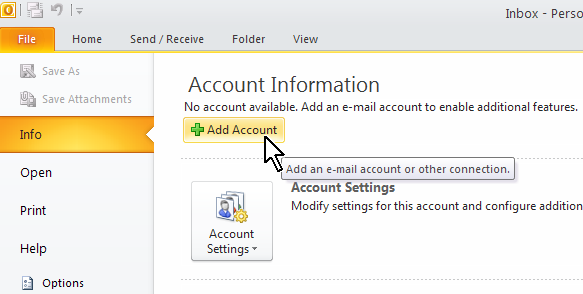 Click [NEXT] and Outlook will now test your account. You should click [Close] followed by [Finish]. 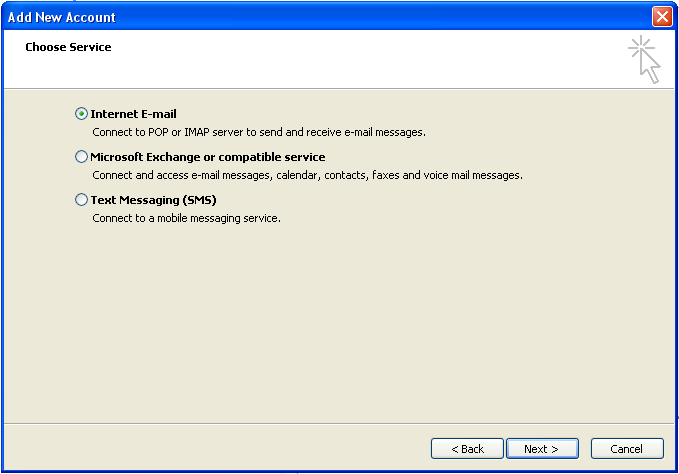 Adding extra email addresses to Outlook using the same email account/mailbox. It's more ecconomical to use a single mailbox or mail account for multiple addresses when they're destined for a single individual. If you wish to add extra email addresses, you should first set up a forwarder so that mail from other addresses can also be received into your email account (mailbox). Once you've done this, you need to set up another email account by following the instructions above but change the email address to the new address you're adding. ALL other settings (including the User Name should remain the same. Once that has been done, press the CTRL-ALT-S keys. This will bring up a window called "Send/Receive Groups". Click [Edit], select the account that you've added and remove the tick from the "receive mail items" box. Repeat this process for all extra addresses you add.